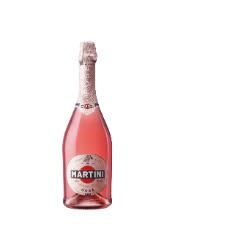 Martini Rose is an elegant, salmon-pink sparkling rosé wine, from the Martini family. The wine has a semi-sweet taste, with notes of fresh strawberry and a citrus finish. It is a soft, fruity and well-balanced wine. This wine is a beautiful soft pink in colour and tastes as lovely as it looks. For more than 150 years, Martini has been passionate about crafting quality wine. Setting new standards, creating new styles of sparkling wines like rosé & demi-sec makes Martini one of the pioneers in the story of Italian wine production. Today, Martini Spumanti embodies a winemaking heritage handed down from generation to generation.